The prospects for Górnik Zabrze seemed nearly perfect a few years back. A sponsorship deal with Allianz, promise of a new stadium from the municipality and nearly natural hope for “Allianz Stadion” for Poland’s most honoured team. But today Allianz’s engagement is a thing of the past, while Allianz Stadion is indeed under construction, but in Vienna, Austria. As if that wasn’t enough, Górnik is on the brink of financial collapse, desperately kept alive by supporters and the municipality. New stadium in Zabrze, under construction since 2011, is almost two years (!) behind schedule and the team may be forced relocate to a neutral venue. Starting next season, licensing regulations in Poland change, requiring every team of the first league to have no less than 4,500 seats available, while Górnik’s current single grandstand barely meets the existing 3,000 minimum. The once-great team may need to seek refuge in Sosnowiec, where once Cracovia and Wisła Kraków also played home games during their stadium reconstructions. Three stands of the new Zabrze stadium, able to hold just over 24,000 fans, were set for delivery in April of 2013. But constant delays led to the general contractor Polimex-Mostostal being sacked in Nov 2013. The project had nearly annual delay already at that point. 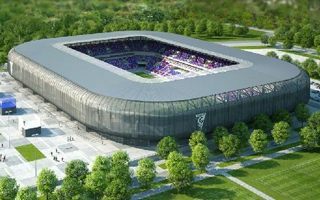 The city’s subsidiary Stadion w Zabrzu decided not to launch one general tender for remaining elements, hoping that splitting works into several smaller tenders would speed up the project. It did no such thing, in fact quite the opposite. Progress is dramatically slow, tenders are being ran in an untimely fashion and the overall price keeps going up. Just last month second tender had to be announced for the eastern plaza with kiosks, toilets and leisure spaces, because the only offer in first bidding was 67% higher than the investor’s estimated budget. However to keep this deadline, everything has to go swimmingly with the latest tender, as well as with works ongoing currently. Any slip may force Górnik out for half the season. April 14 will be decisive. This is when Stadion w Zabrzu will open bids for the equipment of stands. Seats, railings, fences and other elements of basic equipment need to be delivered in 4 months from contract signing (south stands in 2.5 months). Any trouble with the tender may force Górnik out of Zabrze, which only means further trouble for the club that barely keeps afloat.